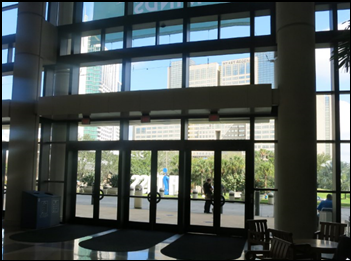 It was pretty dead in the convention center today, which I assume means that those who paid for pre-conference sessions were dutifully and (hopefully enjoyably) attending them. Attire ranged from shorts to suits, reminding me that one of these days I’m going to show up wearing a tuxedo, which might be fun since I’ve never worn one (or perhaps the white dinner jacket variety would be cooler). I wasn’t interested enough to head back to the opening reception, so I have nothing to report about that. I’ve always found it to be a waste of time except as a convenient location to try to meet up with people for a dinner outing, which I’ve never done either. There’s free WiFi in the convention center, named OCCC_Free or something like that. I Speedtested it and it was pretty good with low latency and a 5 mbps download speed, although that will likely degrade to a standstill when the place fills up. This is Paul, the friendliest and most efficient registration person I’ve seen. I wish Paul could be cloned and assigned to moving people through lines everywhere (like in airports). 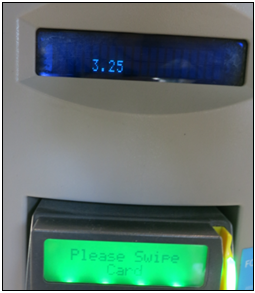 He greeted me like a long-lost relative and steered me to the kiosk, where a quick barcode scan from my phone’s copy of the registration email triggered printing of my badge. Then all I needed to do was pick up the pre-loaded backpack and it was done – no longer do you have to slide through the line stuffing your new bag with various publications, handouts, and addenda. 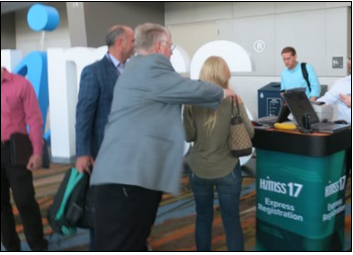 HIMSS improves the process every year. Paul was the first person I encountered and he made me feel valued and welcome. He was working the entrance by the parking lot. Caradigm always does great backpacks and the one’s the best. I’ll actually take this home for later use instead of stuffing it into a trash can somewhere between leaving the hall for the last time Wednesday afternoon and arriving at the airport. I like everything about it, including the color. The exhibit hall is shaping up, although it was hot as blazes in there Sunday afternoon when we were setting up our microscopic booth (#4845). Luckily, it took us about five minutes. The HIMSS exhibit person helped us choose a great location even though we don’t have any HIMSS points and we always get the smallest, cheapest available booth. We’re on a corner near some far more impressive neighbors, although I guess it really doesn’t matter since we’re not selling or demonstrating anything. I see the exhibit hall opens at 10 Monday morning and at 9:30 the next two days. Is it my imagination that it gets earlier every year, not to mention that it now doesn’t close for lunch like it used to? 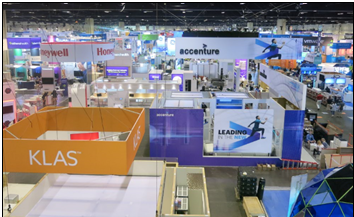 I say HIMSS should just ring the cash registers even harder by running the exhibits 24×7 during conference week – they are almost there already. HIMSS18 would be ideal since it’s in Las Vegas, where the casinos never close so that neon-stupored gamblers irrationally feed the profit engine all night long. 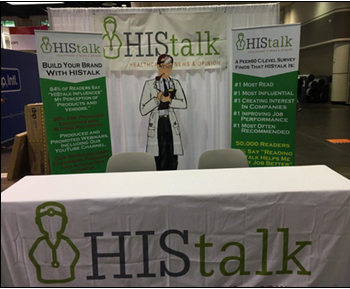 Here is our magnificently furnished HIMSS edifice, a study in cost-effective restraint. The back banner cost $30. The two pull-up signs were $79 each. The table drape was $40. The smokin’ doc standee was $80. Total cost: around $300, and all of it is reusable if I decide it’s worth packing and shipping back home (it all fits into two fairly small and light boxes that we just carry into the exhibit hall). Recall the results of my just-completed reader survey, which found that the most important reason people stop at booths is because of friendly, alert reps. That was a relief since that’s all we really have. Still, it’s fun when executives timidly inquire if it’s OK to take a selfie with the smokin’ doc, then beam proudly with their arm slung over the standee’s shoulder as we snap a picture for them and wonder exactly what they’re going to do with it. We’re giving away those fantastic conference first aid kits from Arcadia Healthcare Solutions again to help attendees deal with the inevitable aches, blisters, and gastric upset that the conference creates. 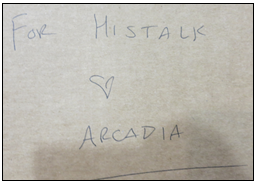 The box of them was sitting on our little table with this cute note. Thirst-slaking isn’t cheap at the Orange County Convention Center. At least it was a 20-ounce soda and it was ice cold. Remember the old days when badge ribbons were rare and those who had them were envied as movers and shakers? 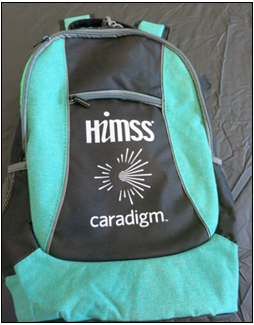 No longer – HIMSS puts out a rack full of them for anyone who wants one and vendors give them away, too. I think HIStalk may have been an innovator since I think I did this in around 2006 with some kind of snarky, long-forgotten saying that I was afraid would get me in trouble. 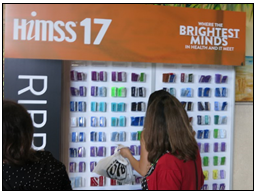 I think it was the same year I was snapping a photo in the exhibit hall and someone from HIMSS scolded me. I’m puzzled by this restroom sign. Are there times when the floor is wet and yet it isn’t slippery? A reader tipped me off to an Orlando tourist area scam that’s been written up in the local papers. You come back to your hotel room and find pizza delivery flyers that have been flung under the door. Hungry and tired, you call in your order, which never arrives. The reason: there’s no such place – it’s just a thief’s phone to which you’ve just provided your credit card number. 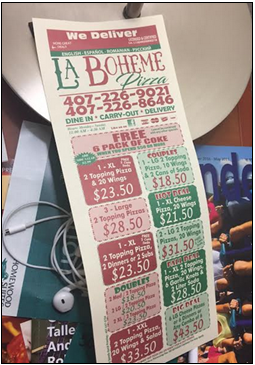 Google the restaurant name before ordering, like the non-existent La Boheme Pizza above. The second clue is that the number is often a mobile voicemail box that’s full, probably with messages from angry customers demanding to know why their imaginary pizza is taking so long. The reader is staying in a HIMSS hotel and has received two fake ads so far, while I have received one. Perhaps they should have just replicated a Domino’s or Papa John’s flyer and used their own telephone number to suppress suspicion, although maybe those places aren’t as appealing. The flyer also offers dine-in and carry out where the fraud wouldn’t work, but without an address, those are probably seldom chosen by hotel guests with cranky children wearing Disney ears or who are happily shedding their HIMSS badges for the day. Akron Children’s Hospital (OH) hires Harun Rashid (Children’s Hospital of Pittsburgh) as VP/CIO. A reader tipped me off that five bidders are in the hunt to supply Nova Scotia with a provincial clinical information system: Allscripts, Evident, Meditech, Cerner, and Harris Healthcare. 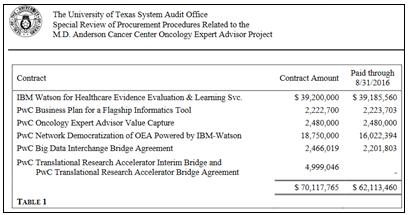 A University of Texas System audit finds spending irregularities in the money-losing MD Anderson Cancer Center’s now-stalled $62 million IBM Watson-powered Expert Oncology Advisor project. The audit found that the system hasn’t even been piloted anywhere and contains outdated drug and clinical trials information, while on the financial side, MDACC didn’t run a competitive bidding process, paid fees that were set just below the amounts that would have required board-level approval, and spent donated funds before they were received. We spent a chunk of time today hauling HIStalkapalooza stuff (banners,signs, etc.) to the House of Blues. It’s looking good for Monday evening. HOB is a pretty cheap Uber ride for those planning to imbibe. Doors open at 6:30, dinner and music start at 7:00, the HISsies will kick off at 7:45, and Party on the Moon will play from around 8:15 or 8:30 until 11:00. We usually don’t open the bar first thing because of the cost when most people are still filing in, but I’m going to bump up against the HOB minimum and figured I might as well start the drinks earlier and fancy up the menu at little. Please take a moment to thank the companies sponsoring the event – it’s pretty generous of them knowing they are funding the attendance of their competitors and non-decision-makers whose only common attribute is that they are fellow HIStalk readers. Here’s an important note. As usual, we’ll lock the HIStalkapalooza doors no later than 8:30 and nobody (even invitees) will be allowed in afterward. Reason: each person who passes the HOB clicker guy costs me about $200, and I don’t like paying for someone to drop my for a quick drink on the way to somewhere else. I’ll be lucky to break even on the event and latecomers could push me into the red with little benefit to anyone. I don’t have many Orlando recommendations, but I can say that I’ve been happy with these modestly priced restaurants where I had dinner the last three nights, all a short drive from the convention center: Delmonico’s Italian Steakhouse, Ciao Italia, and Bahama Breeze. I think you’re going to need to spend another $79 on a new pull-up sign. I just read on a very influential blog that Peer 60 renamed itself to Reaction. (or you could use white out and a sharpie). Ouch! That may be the swing vote for not exhibiting at HIMSS18. That and the $5,800 booth rental fee that provides pretty close to zero ROI since we just use it as a place to hang out and say hello to whomever wanders by. “Smokin’ Doc” continues to be the best medical-related logo ever. Never change!! Don’t sell yourself short – I can tell you this decision maker couldn’t be happier attending HIStalkapalooza this evening and realigned several other meetings for this one. 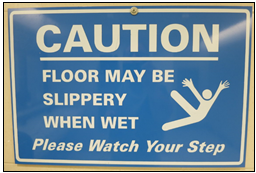 I dig the Bob Fosse jazz hands on the slippery-when-wet sign. Makes me want to take the afternoon off and watch “All That Jazz” again. Actually, yes! Picture an old-school floor, the kind that they have in old hospitals and schools. The janitor polishes it up with one of those large circular polishers, till it shines like a new penny! 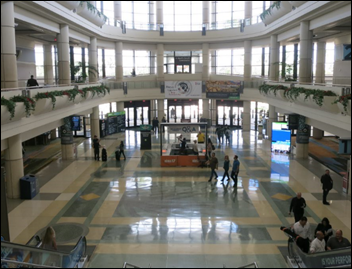 Or, one of the fancy marble floors like those pictured in the lobby of the Orlando convention center. All you have to do is to add dress shoes with leather soles. It’s an adult Slip-‘n-Slide!